Electric Motors and wet paint don’t usually play too well together. Eventually things get clogged and parts have to be replaced on even the best paint sprayers. 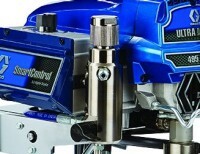 But Graco’s ProConnect pump allows users to replace the pump ridiculously fast. In about a minute (or less once you’ve done it a couple times), your crew is back to work instead of losing productivity! 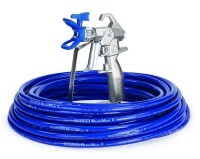 The Ultra® Max II 495 PC Pro features the leading technology and performance of Graco's larger Ultra Max II models. The Ultra Max II 495 PC Pro is the sprayer of choice for professionals who need a higher output sprayer for daily use on residential jobs. - Endurance™ Now program available . Creative Engineering is the official distributor of Graco's in Vietnam and Asia. Contact us for further consultation on Graco's machines!